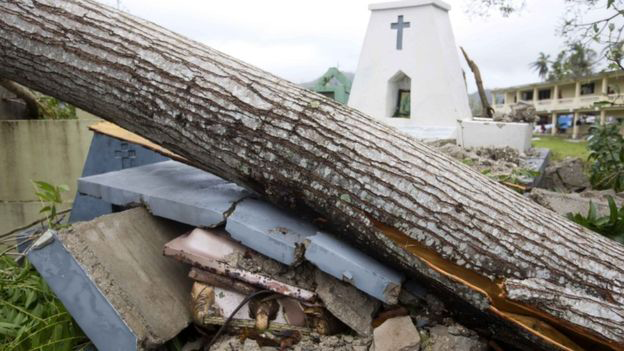 The storm passed directly through the Tiburon peninsula, driving the sea inland and flattening homes with winds of up to 230km/h (145mph) and torrential rain on Monday and Tuesday. 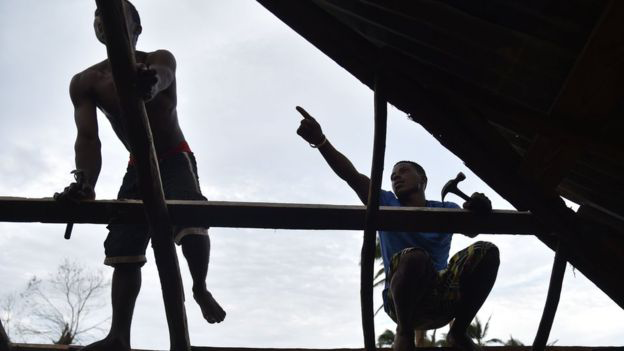 The collapse of an important bridge on Tuesday had left the south-west largely cut off. Non-governmental organisations said phone coverage and electricity were down and people were running out of food and water. 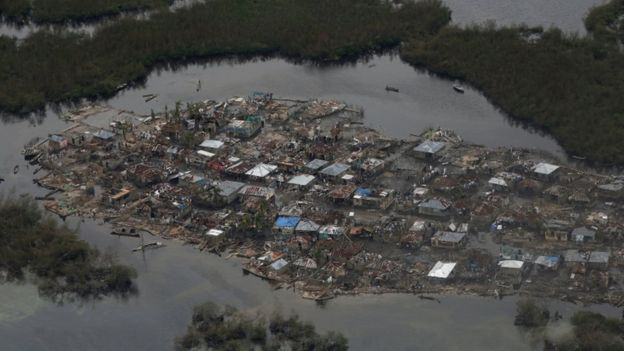 The BBC's Tony Brown in south-western Haiti said he had seen people trying to cope with the mass destruction on their own, trying to rebuild from the rubble but without the help of the army or police. 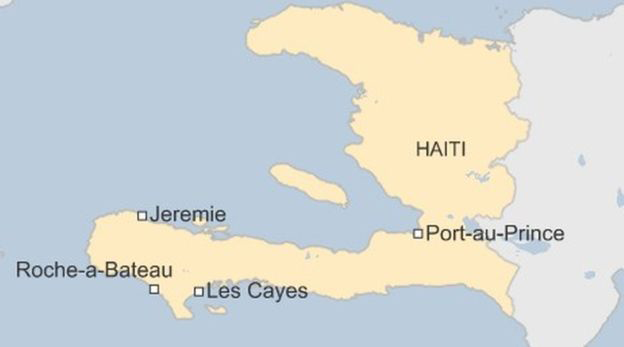 Les Cayes resident Jean Joseph described the scene in his town - one of the worst-hit - as "complete devastation". "What's going on right now is a lot of people are walking around," he told the BBC. "They have no home. A lot of them - they're just walking around. I don't know what they're going to do." The Red Cross has launched an emergency appeal for $6.9m "to provide medical, shelter, water and sanitation assistance to 50,000 people". 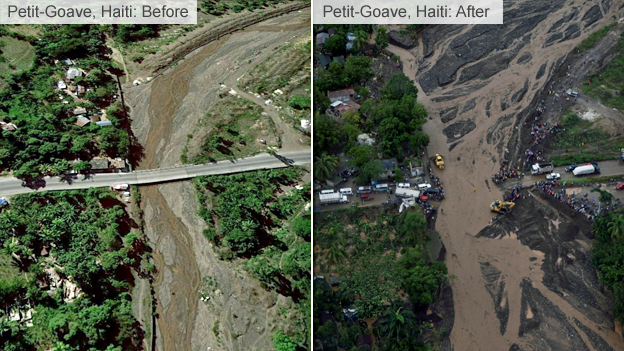 The US is sending nine military helicopters to help deliver food and water to the hardest-hit areas. 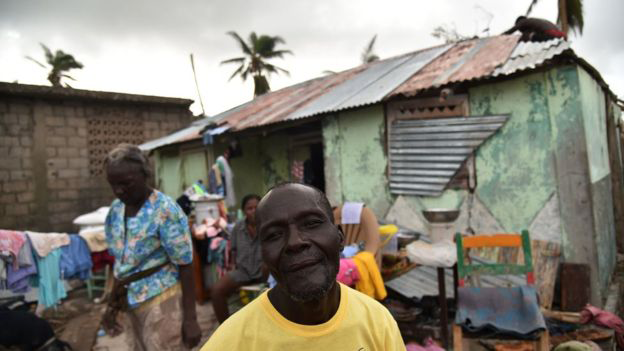 The country is one of the world's poorest, with many residents living in flimsy housing in flood-prone areas. 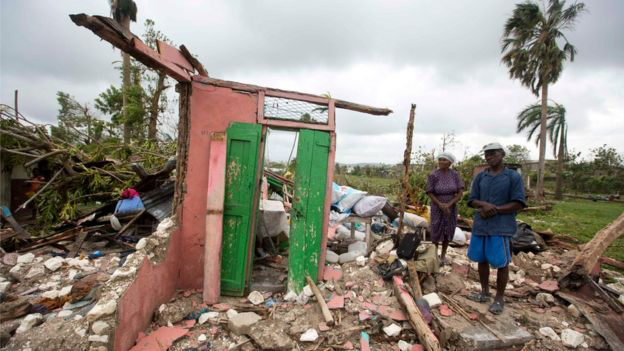 Four people also died in the storm in the neighbouring Dominican Republic on Tuesday. Meanwhile in the US, evacuation orders have been issued for areas covering some three million inhabitants. The storm has so far stayed off the coast, lessening the potential impact to southern Florida, and it remains unclear when, where or if, the hurricane will make landfall. Nevertheless, rain and high winds lashed the Miami area overnight. Some 240,000 homes and businesses have been left without power in Florida already. Some areas in the state could see rainfall of up to 15in (38cm), but the main threat appeared to be from seawater surges along the coast right up to South Carolina. 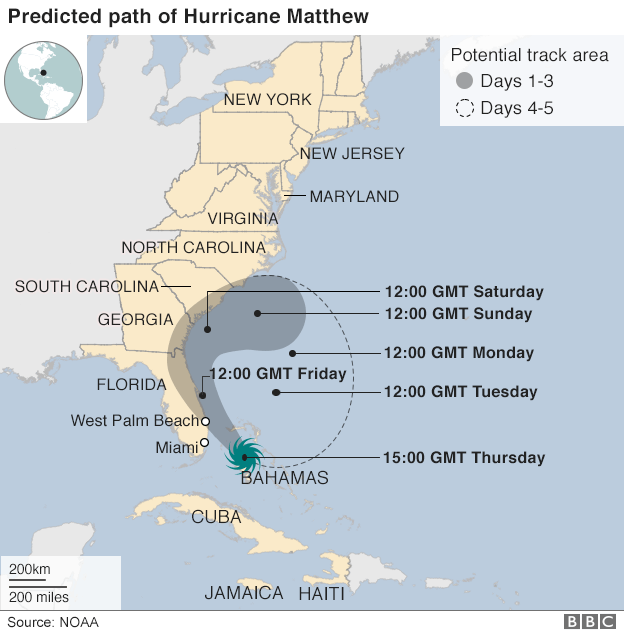 Florida Governor Rick Scott said: "Think about this: 11ft (3.3m) of possible storm surge. And on top of that, waves. So if you are close, you could have the storm surge and waves over your roof." 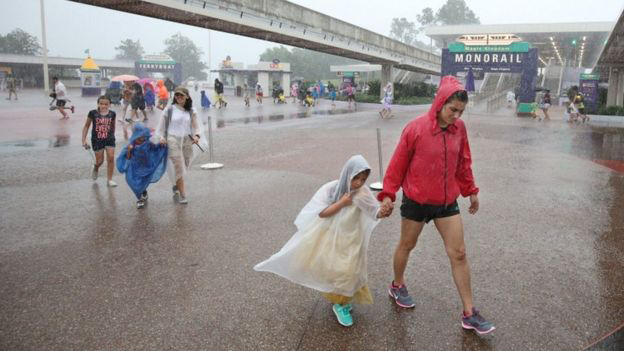 Orlando theme parks Walt Disney World, Universal Studios and SeaWorld are shut. 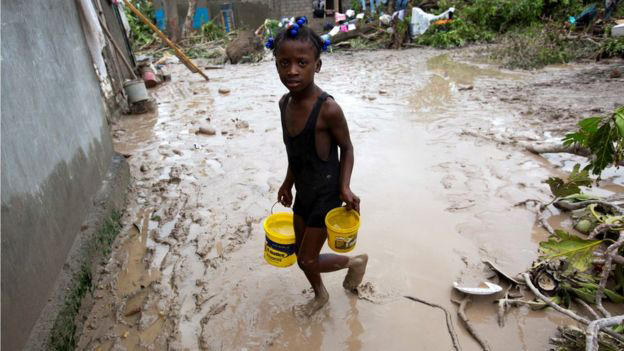 More than half of Haiti's city-dwellers live in overcrowded shantytowns that take the full force of any earthquake, hurricane, or disease outbreak. An ongoing cholera epidemic, triggered by the arrival of UN troops after the 2010 earthquake, has killed thousands of people. Political instability and corruption have been a factor. Without effective government for decades, Haiti currently ranks 163rd out of the 188 countries on the UN Human Development Index. It spends little on storm defences.